GOOD GRAVY! What happened to multiplayer matchmaking? Im having this issue. Just got kicked after finding a match. Got Ibiri error, but then could search again. The person I was searching with is stuck on the dissolving lobby that wont dissolve. I’m in a vicious loop of finding a match and the lobby dissolving. It’s been like this for about 15 minutes and I can’t escape without a ban. I’m trapped. This is purgatory. 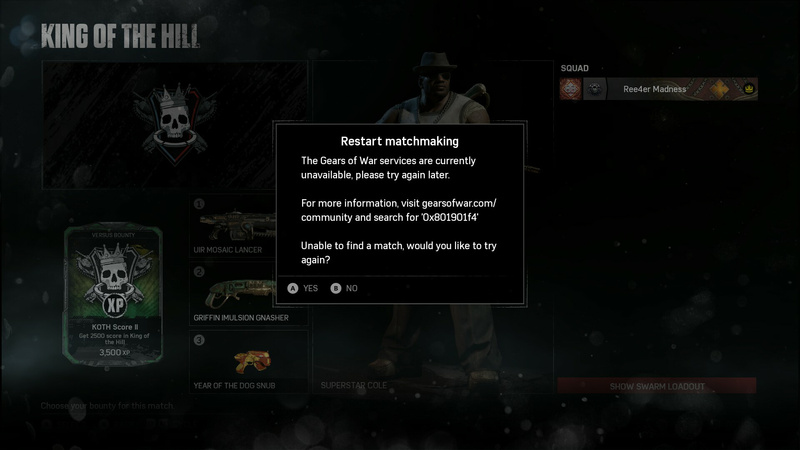 I was able to complete 1 match before this on Rustlung, then I almost made it into another match, all 10 people loaded in to the map, then before the final countdown started, it booted me to the main menu, no option to rejoin and a 15 min ban. Same here trying to play Horde. Won’t connect to Gears Services. Must be something wrong with the servers. Ever notice this crap always happens when there is a XP multiplier on?! I had to quit out eventually, even though it said I will get a penalty, which in itself is pretty stupid. I played Titanfall 2 instead, which is great but not Gears. It doesn’t always ban you pre game lobby. During the searching screen it warns you but I find it won’t ban you. Same here. I can not find a single match since today. Yep, it’s a mess right now. Yeah, they should extend it for a month and give everyone and Elite pack.